In their latest report titled – “Screw Closures Market - Global Industry, Size, Share, Growth, Trends and Forecast, 2018–2027”, Transparency Market Research (TMR) delivers key insights on the use of different materials and processes used for screw closures, along with various end uses and applications. According to TMR, the global screw closures market is projected to clock a CAGR of 5.0%, during 2018-2027, which is attributed to several factors, on which, the report provides thorough insights and forecast. The APEJ (Asia Pacific Excluding Japan) screw closures market is expected to take the rise in terms of CAGR. The global screw closures is experiencing growth due to an increase in demand from the beverage, food , pharmaceuticals, and personal care & cosmetics industries. The Asia Pacific excluding Japan (APEJ) region is estimated to be the largest marketplace for the global screw closures market. In this report, TMR has discussed individual strategies followed by the recent developments in the screw closures product segments. TMR suggests that the increase in the growth of single-serve beverages is expected to be a key driving force in the growth of the screw closures market globally. Polypropylene has been found to be the most widely used material for screw closures. Out of several plastics, LDPE, HDPE, polypropylene, metal, and thermosets are expected to witness maximum use for screw closures. Polypropylene is estimated to account for more than 50% of the global screw closures market by value. The TMR study analyses the screw closures market in several regions and focuses on the key dynamics affecting the screw closures market, globally. The Asia Pacific excluding Japan (APEJ) screw closures market is estimated to be highly attractive in terms of market share and CAGR during the forecast period. By diameter type, the 63 mm–100 mm neck diameter segment is majorly preferred by consumers in 2018. 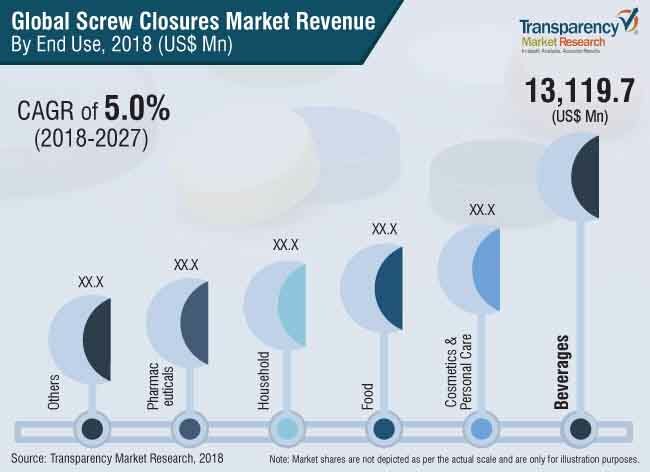 The screw closures market for the beverage industry in the Asia Pacific excluding Japan (APEJ) is projected to register the highest CAGR among other end-use segments during the forecast period. The North American screw closures market report includes a country-level analysis for the U.S. and Canada. The U.S screw closures market is expected to dominate the regional market throughout the forecast period. The Latin American screw closures market includes a country-level analysis for the Brazil, Mexico, and Rest of Latin America. Brazil is projected to witness fast-paced growth, while Rest of Latin America is estimated to be a prominent screw closures market in terms of market value during the forecast period. In the European screw closures market analysis, prominent countries such as Germany, the U.K., Spain, France, Italy, and Rest of Europe are analyzed. The U.K screw closures market is projected to grow at the highest CAGR among other countries in the European region. Germany and Italy are estimated to be highly attractive screw closures markets in terms of market value share. The Asia Pacific excluding Japan (APEJ) screw closures market includes a country-level analysis for China, India, Malaysia, Singapore, Australia, & Rest of APEJ. The Middle East and Africa (MEA) screw closures market includes a country-level analysis for North Africa, GCC Countries, South Africa, Israel, and Rest of MEA. In the Middle East & Africa screw closures market, Israel is projected to expand at the highest CAGR during the forecast period while the GCC countries segment is the largest marketplace for screw closures throughout the forecast period. Key players profiled in the screw closures market include Amcor Limited, Berry Global , Inc, Aptar Group Inc., RPC M& H Plastics Ltd, Silgan Plastic Closure Solutions, O. Berk Company, LLC, Closure Systems International, Inc., Bericap GmbH and Co KG, Global Closure Systems, Weener Plastics Group BV, Blackhawk Molding Co. Inc., CL Smith Company, Georg MENSHEN GmbH & Co. KG, Mold-Rite Plastics, LLC, Alpha Packaging, Inc., and Comar LL.